In fact, the middle class itself is on the verge of extinction. This is the single greatest economic threat facing the United States today and yet, hardly anyone is talking about it. 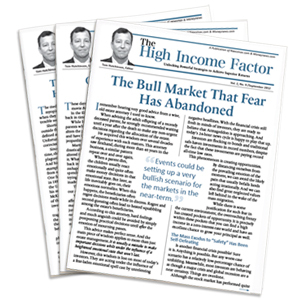 Each issue will focus on a theme that analyzes a recent trend or aspect of the market environment from which income investors can benefit, and specific ideas that take advantage. All investment ideas will be presented in an easy-to-read, common-sense manner that gets right to the point. Specific investments will include a thorough analysis of the company or fund specifics, industry fundamentals and trends, as well as the effect of the general market and economic environment. The High Income Factor will enable you to confidently adjust your strategy to prosper in the brave new world, and it will be a crucial and dependable partner in providing regular income in a market environment that can seem difficult to navigate. Plus, we'll keep you updated with free email alerts from Moneynews. Welcome to The High Income Factor. I look forward to working for you and it is my supreme honor and pleasure to be part of your investing life.